Yazmyne Vasquez is International LL.M. Career Advisor​ in the Career Development Office. She obtained her LL.M. in American Law from Wake Forest University School of Law, and received her J.D. from San Martin de Porres University School of Law in Lima, Peru. Prior to working at Miami Law's Career Development Office, she worked for a major legal search and staffing company in Chicago, Illinois where she handled associate and in-house placements. 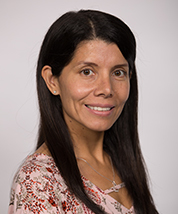 She also has several years of international and immigration law experience, including working at the Peruvian Department of Justice, Office of the Pardon Attorney preparing the Department's recommendation to the President for final decision. She is a member of the Hispanic National Bar Association and is an Advisory Committee Member of the South Florida Group of Regional Counsel.